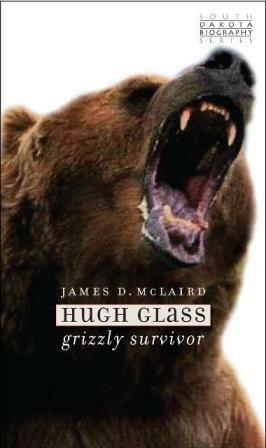 “Hugh Glass: Grizzly Survivor” is written by James D. McLaird and published by the South Dakota State Historical Society at the Cultural Heritage Center in Pierre, which is also the location of the only known letter written by the infamous trapper. “Hugh Glass: Grizzly Survivor” tells the story of the most famous grizzly-bear attack in the history of the American West, taking readers along Glass’s 200-mile crawl across the plains and his journey of revenge against those who abandoned him. The exploits of Glass have long provided fertile ground for articles, books and film, but the real man remains a mystery. Historian McLaird traces the threads of the legend back in time and revisits what readers know—or think they know—about Glass and his ordeal. Along the way, McLaird examines the story itself and how it reflects our changing view of the West, the development of the fur trade and the complicated relationship between humans and grizzly bears. The result is a comprehensive biography of a larger-than-life character whose fantastic story of survival has fired imaginations for nearly 200 years. McLaird is professor emeritus of history at Dakota Wesleyan University in Mitchell. He is the author of the second South Dakota Biography Series book “Wild Bill Hickok and Calamity Jane: Deadwood Legends” and numerous articles on the Black Hills and the American West. McLaird will discuss the book at the monthly History & Heritage Book Club on Tuesday, June 14, at 7 p.m. CDT at the Cultural Heritage Center. “Hugh Glass” is made possible in part by the Deadwood Publications Fund provided by the City of Deadwood and the Deadwood Historic Preservation Commission. “Hugh Glass: Grizzly Survivor” is the latest addition to the South Dakota Biography Series published by the South Dakota Historical Society Press. The book is available for $14.95, plus shipping and tax. It can be purchased directly from the South Dakota Historical Society Press at www.sdhspress.com or by calling (605) 773-6009. The book is also available at the Heritage Stores at the Cultural Heritage Center and state Capitol and from bookstores and online retailers.